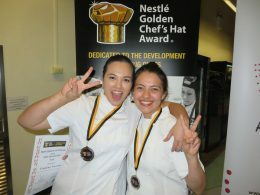 The Nestlé GOLDEN CHEF’S HAT AWARD regional heats are wrapped and aside from the most teams from the most regions around Australia entering into the 2016 Award, six of ten finalist teams are talented all-girl duos – the biggest female chef team representation in the history of Australia’s longest running culinary competition for young chefs. What’s more 60% of the teams have achieved gold medals to secure finalist places, ensuring that the culinary arena will be heating up at Fine Food in Melbourne next month when the ten teams battle it out in front of a live audience. The 2016 line-up will also see some familiar faces back to cook their hearts out for the national winners title, including team Northern Territory sisters Ryleigh Hunt and Jenita Hunt, New South Wales chef Adelene Stahnke and Western Australia chef Cherise Davids. This year’s national winning team will be awarded what promises to be a career kick-starting culinary trip to North America.